The staff was absolutely great, even when I mistakenly booked the wrong cabin at first when I called an without any issues they got me into a different cabin of my preference choice that suited all the guest staying with us! The cabin was really nice and the check in an our process was very easy! We will definitely be using cabin USA again! We truly enjoyed our stay at Rocky Retreat! The layout of the cabin was awesome. The location was very convenient. It does need a new pool table but thats the only complaint i can find. The cabin was extremely clean! Can't wait to go back. The cabin's location was ideal for going back and forth to town and quietness. The view would have been better if you didn't have to look at a closed community pool on the back side of the cabin. The cabin could use more lighting in the kitchen, it was very dark in the kitchen. There were no extra blanket's. It was very clean, although needed more small wash clothes. I would recommend this cabin to my friend's. Beautiful cabin. The game room was kind of small for a pool table couldn’t really play due to walls being to close to table. That was the only thing that we didn’t like ... there was a problem with wasp but they came right out when we called. Loved it !!!!! Cabin was beautiful and sowas view other than there was some construction going on below during our stay so the equipment was a little distracting. Site also said there was 2 sleep sofas and only had one that needed a new mattress badlly. Overall it was very nice. The cabin had a great view of Dollywoods fireworks from the back porch. While this cabins location was perfect there were many issues. Lots of broken things , and there was a horrible smell outside at night time. If things were fixed I would stay in this cabin again. The veiw was very nice. We had an awesome time. Cabin was great. My family and I came to this cabin for mother's day weekend and we had a blast. This cabin is wonderful, a great location and etc. There were a few cons about this cabin, the tv's are old and and the pictures from the website are not the same. The game room needs a little more love to it, it doesn't feel like a game room and the walls are all scratched up because the pool table is close to the walls, other than that this cabin is great and will be returning soon. Our stay was great! Upon arrival, the water level in hot tub was very low. I called the office and they sent somebody to fill it. On our 2nd day there, we realized later in the day that when our other guests arrived, there weren't enough blankets. I stopped by the office around 9pm and figured we wouldn't get any additional blankets until the next day because maintenance had to bring them. At 11pm, maintenance showed up at the door with blankets. A couple of things were a little "run down" and could be updated. We were very impressed with the time frame in which our issues were dealt with. Overall, our stay was very nice and I would recommend this cabin company to anybody in the future! Hot tub was broke, when they came to fix it, it took 5 hours to heat up. Chairs were broken and garbage was left on balcony. Walls could use a touch up paint. Booked with this company multiple times, not the best cabin but we had fun. This is our 6th booking with Cabin's USA in the past three years. This one is the best yet, the view, the space of the cabin, it was just beautiful. Took our kids for spring break, they loved it! We will definitely be back next year with the kids. And my wife and I will be back some time this year by ourselves. We had a wonderful time at the Rocky Retreat Cabin. It was very cozy. There were a few cosmetic issues such as broken blinds, worn carpet, missing light fixtures, but it didn't take away from the overall feel of the cabin. Our family loved playing pool. The pool table was a little close to the wall so it was hard to hit some of the balls as your pool stick kept bumping into the wall. We would definitely rent this cabin again. The cabin itself was great. Perfect size for my family & in the perfect location for my needs (I was in town for an event that I needed a specific location & this cabin was perfect). My only issue was the hot tub. The only time we were going to be able to utilize it was the first night we were in town. After we arrived & got settled we went to the hot tub to find that the temp had been turned down extremely low & the water was cold. I turned the temp up however it took a very long time for the water to heat up. We gave it a shot anyway but when we turned the jets on only half of them worked. After of few minute of lukewarm water at best & only half the jets working we gave up. From my understanding the hot tubs are cleaned after each visitor & if this is the case the cleaning staff should turn the temp back up for the next arriving guest. We will be staying in another of your cabins in May & hope to be able to utilize the hot tub that weekend. It was nice, great view, house keeping could have done a better job, as the commode upstairs was clogged when we got there, both Jacuzzi tubs and hot tub were a little nasty, a spatula in the cabinet still had cooked eggs on it. We've booked with Cabins USA twice now, this last time was the only one that we had problems with. We checked out and decided we wanted to stay again in a smaller 1 bedroom for just 1 night as it was Saturday evening, the guy at the desk told me that they don't do 1 night rentals. The last time we booked, was for 1 night and had no issues at all and the sign clearly says $69.00 1 bedroom walk in special and was informed that that is for a 1 night rental, which I already knew. This property is nice area. The cabin needs some TLC. Lighting is not sufficient, the beds are worn out and uncomfortable. The faucets are old and hard to get to hot water, tv is the size of a computer screen, the basement area with the pool table is worn with a damaged pool table, no chalk, pool sticks were warped and the table had a tear in it. It was unlevel. The location of the pool table makes for difficulty also because of sticks hitting the walls. Had to open the door in 10 degree weather to make a shot. For $250 a night our expectations for the cabin was not there. Cabins USA did a great job managing for stay but owner of the cabin needs to spend some money and upgrade some things. The cabin was great! The view was beautiful. Loved the cabin, but driveway a little steep. Was not good if you have 2 cars. Need to get major tv networks. We loved this cabin. It was private, but conveniently located. The only downfall is there is a landfill that you can smell every once in a while, but not often. Overall we had a great stay. Beds were a little stiff, but we were happy they were clean! The hot tub wasn't working when we arrived, we made a call and the maintenance crew was there within the hour!! An easy fix, just a blown fuse. By that night we were able to fully enjoy the hot tub as well. As always, we will definitely be returning and using Cabins USA. I am so happy to hear that you enjoyed your stay in Rocky Retreat! We here at Cabins USA strive to give each of our guests the best stay possible while vacationing in the Smokies. When you are ready to stay with us again, please mention you are a return guest for an additional discount. Thank you again for your review and thank you for choosing Cabins USA! Nice cabin for the price. Upstairs shower curtain had some mildew on it and drain was clogged in the shower . The porch needs to be power washed. The ramp going out to the driveway was very slick when it rained. Overall , though was very convenient to everything and a good overall value. Thank you for taking the time to let us know about your recent stay in Rocky Retreat. We here at Cabins USA strive to give each of our guests the best stay possible while vacationing in the Smokies. I apologize for the issues you experienced, but your comments have been forwarded to our maintenance to be addressed. Thank you again for your review and thank you for choosing Cabins USA! Cabin was beautiful, clean, and comfortable. However, this lists that the cabin sleeps 8. It only sleeps five. There are no longer two sleeper sofas, only one and a twin bed. Maximum amount would be 7. We had 8 in our party so we had to make do but I would appreciate you updating the amount of beds for future customers. However, we loved the cabin otherwise and had a fabulous time. We will definitely be booking with cabins USA again! This is our second year in a row renting a cabin from CabinsUSA. Reserving, checking in and check out could not be any easier. Rocky Retreat was a great value for the money and in a very convenient location. Thank you for all of your kind words! We here at Cabins USA strive to give each guest the best stay possible while vacationing in the Smokies. Thank you for continuing to choose Cabins USA and we look forward to seeing you again soon! Thank you Cabins USA for making our stay a pleasant one. Can't wait to go back. This cabin was exceptional. The location was perfect I will be reserving it again. The only small issues was the musty smell in the basement and the bed upstairs in the room was not comfortable. There was only one extra blanket also but other then that this cabin rocked! Thank you for taking the time to let us know about your recent stay in Rocky Retreat! We here at Cabins USA strive to give each guest the same great stay you enjoyed while vacationing in the Smokies. When you are ready to stay with us again, please mention you are a return guest for an additional discount. Thank you again for choosing Cabins USA and we look forward to seeing you again soon! This cabin was great! It's in a cabin community, but sits tucked away at the end of a cul-de-sac and has the most privacy and best view from the back deck compared to the other cabins. The cabin is spacious, clean, and has everything you need. It's also a perfect location - only a few minutes from all the Pigeon Forge attractions. The only "negative" was that the carpet needs to be replaced, but it wasn't awful, just a little old. We had 5 people in the cabin and the rooms were perfect. The two suites each had a queen bed and full bathroom, and the loft upstairs had a sleeper sofa and a twin bed. We would definitely stay here again! We came home two days ago and are already wishing we were back at Rocky Retreat. Cabin was in Great Location. Bad that pool has been closed and growed up around. Good altogether experience. We loved the cabin it was beautiful, but if u drain the upstairs tub it leaked into the downstairs bedroom. Some of The kitchen utensils were missing. But other then that it was a gorgeous view and great location. We did have a little visitor possibly a raccoon but he went away. Thank you for sharing this cabin with us. Although the cabin was extremely gorgeous, we had no sheets, pillow cases, towels, hand soap for bathrooms and the jacuzzi's when turned on in the rooms, spit out black slimy stuff. I did email the office and they brought our supplies immediately and we're very courteous! When we come down again next year, I will probably go with a different company because there's many to choose from and I expect to receive what I pay for. After all I had to pay a cleaning fee so why wasn't it done when I got there. The location is great. Close to everything and not far up any mountain. The view is beautiful! I am used to staying in better cabins as this one the carpet needs cleaning REALLY bad, there were stains on chair cushions in the living room. Really visible stains to not want my family or myself to want to sit on them. And the beds are not so comfortable. We use cabinusa every time we travel to TN and it surprised me that this cabin was like this as all other cabins that we have stayed in have been phenomenal! Anywho, regardless our stay was smooth and successful. Thanks again! We could not get the fireplace to work or the wifi. Instructions on how to work certain things in the cabin, such as the two listed above, would have been helpful. The gravel driveway is deeply rutted making it difficult to navigate up. As a warning you may want to mention the driveway in directions to the cabin. The cabin was beautiful and we enjoyed our stay. I am so happy to hear that you enjoyed your stay in Rocky Retreat! We here at Cabins USA work hard to make sure each of our guests have the best stay possible while vacationing in the Smokies. When you are ready to stay with us again, please mention you are a return guest for an additional discount. Thank you again for your review and thank you for choosing Cabins USA! The cabin was good, but will need some attention in the future, floor covering up stairs is carpet and needs to be cleaned, the large windows on the upper floor on the back of the cabin also needs to be cleaned. Overall the cabin was good, plenty of room and close to downtown Pigeon Forge and Dollywood. With a little TLC I would recommend this cabin, also the driveway on the left hand side of the circle drive is a little tricky if you are driving a car. Thank you for taking the time to let us know about your recent stay in Rocky Retreat! We here at Cabins USA work hard to make sure each of our guests have the same great stay you enjoyed while vacationing in the Smokies. Thank you for letting us know about the carpet and windows. That has been forwarded to our maintenance and housekeeping department to be addressed. When you are ready to stay with us again, please mention you are a return guest for an additional discount. Thank you again for your review and thank you for choosing Cabins USA! Thank you for taking the time to let us know about your recent stay in Rocky Retreat! We here at Cabins USA work hard to make sure each of our guests have the same great stay you enjoyed while vacationing in the Smokies. I apologize for the cleanliness issues you experienced. Your comments have been forwarded to our housekeeping manager to be addressed. When you are ready to stay with us again, please mention you are ready to stay with us again, please mention you are a return guest for an additional discount. Thank you again for your review and thank you for choosing Cabins USA! NICE PLACE TO STAY BUT IT WAS A LET DOWN THAT THE SWIMMING POOL WAS IN SUCH TERRIBLE SHAPE. IN THE PICTURES YOU CAN SEE A NICE SWIMMING POOL BUT THAT WASN'T THE CASE. NEVER THE LESS IT DIDN'T MAKE OR BREAK OUR STAY. WE STILL HAD A WONDERFUL TIME. I am so happy to hear you loved your stay in Rocky Retreat! When you are ready to stay with us again, please mention you are a return guest for an additional discount. Thank you for choosing Cabins USA and we look forward to seeing you again soon! This cabin was rented for our honeymoon/ wedding reception... We enjoying the location. It was in town but you would have never known it... Quit and peaceful. There was plenty of room for everyone in the wedding party. On the down side...... The cabin wasn't cleaned as well as it should have been... We found and adult toy in one of the rooms.. and I wouldn't have wanted to explain the a child what it was.. Cabins need to be throughly inspected after each guest. Cabin is dated. Needs some upgrades, such as TV's and equipment. Unit still has a VCR in place. Hardly enough kitchen dishes and pots n pans to feed 5 people. Hot tub unfit for use. Charcoal grill is ready for the dump. Lots of light bulbs burned out that needed to be replaced. Carpet was filthy and needed cleaning. The place was wonderful everything went very smoothly. The only bad part was the hot tub which was going down hill so when we got in it overflowed on the low side. I am so happy to hear that you enjoyed your stay in Rocky Retreat! We work hard to make sure that each of our guests have the same great experience you enjoyed while vacationing in the Smokies. Thank you for letting us know about the hot tub. We will be sending maintenance out to cabin to inspect that. Thank you again for your review and thank you for choosing Cabins USA! We had a wonderful time on our trip. The cabin was VERY clean and nice. The only issue we had was that the hot tub was cracked on one side and we were scared to use it. Other than that, everything was GREAT and we REALLY enjoyed our stay. I would definitely rent this cabin again! I am so happy to hear that you enjoyed your stay in Rocky Retreat! Thank you for letting us know about the issue with the hot tub. Maintenance will be notified so they can go out and correct that issue. When you are ready to stay with us again, please let our reservationists know you are a return guest for an additional discount. Thank you again for your review and we look forward to having you as our guest again! Great view from the porch! Good location, close to activities, and with a GPS we were able to avoid the busy main streets. Cabin could use a little updating of carpet, and a dehumidifier would be helpful. Kitchen was equipped with the very basics, I would suggest bringing plastic silverware. Staff was very responsive when needed. Also could use a more secure outdoor trash bin, raccoons were a problem. Thank you so much for letting us know about your recent stay in Rocky Retreat! While GPS can be unreliable here in the mountains, we do have some cabins that can be found using GPS. We also give each of our guests turn-by-turn directions that will take them directly to their cabin. Thank you for letting us know about the issues with the carpet and outside trash bin. Those comments have been forwarded on to our owner liaisons and they will be speaking with the owner of the cabin. Thank you for choosing Cabins USA and we look forward to having you as our guest again! We were overall pleased with our stay. However, on arrival, we were greeted by these awful flying insects that were located on every deck outside. Once inside, the cabin was very nice and very clean. The downstairs bedroom window had however looked like it had been broken into previously, it was missing screws and would not latch, the wood also looked like someone had taken a flat head screwdriver to it. The beds were absolutely horrible, woke up every morning with a back ache! The view was great and loved how their was not any neighbors nearby, even tho the parking was terrible and scrapped the bottom of my car every time. The pool which seemed hasn't been working for a few years, was still not working and was rather disappointed to see other rental company pools up and running. The Hot Tub downstairs still has not been fixed from a previous review, the frame is broke and the Hot Tub sits lopsided causing the water to sit unlevel. The Jacuzzi's looked nice, sadly the water heater wasn't big enough to fill them before the water turned cold. Several items downstairs had been missing, photos online show chairs in the pool table room and there was not, causing us to sit on the floor. I did enjoy my stay, and will use Cabins USA again, however will choose a different cabin. Great location and nice cabin. Pool table needed some work and master bedroom toilet's water constantly runned all the time. Had plenty of space and would rent from them again. Thank you for taking the time to review your stay with us at Rocky Retreat. We apologize for any inconvenience you encountered during your stay. We will have maintenance fix the issues reported. We hope that we will hear form you again very soon. Do not forget about our return guest discount. Overall good stay, however, a plethora of ladybugs all over dining-room table and in bed. 3 wasps in the bathroom, upstairs toilet overflowed and leaked in the kitchen and smelly couch. THE CABIN IS BEAUTIFUL AND THE VIEW IS GORGEOUS!! BUT, UPON ARRIVAL THE AIR OUTSIDE THE CABIN SMELLED HORRIBLE! FOUND OUT IT WAS THE SEWAGE, SEVIERVILLE'S FAULT. ONLY SMELLED THAT ONE NIGHT. FINE THE REST OF THE TIME. BUT!!!!!!! HORRIBLE PROBLEM WITH WASP ! A MAN WAS SENT TO SPRAY THE FIRST NIGHT. COULD NOT USE THE UPPER BEDROOM. KIDS DID SLEEP ON PULLOUT UPSTAIRS. NEXT NIGHT TRIED TO STAY, BUT, WASP EVERYWHERE DOWNSTAIRS AS WELL. UPSTAIRS BEDROOM AROUND 75 WASP. GRANDCHILD STUNG. LEFT THAT CABIN AND WAS PLACED IN HILLTOP HEAVEN AT PIGEON FORGE! REALLY NICE. NOT AS PRETTY VIEW, BUT, GREAT CABIN. KIDS LOVED THE AIR HOCKEY GAME. PORCH WITH HOT TUB GREAT. CABIN WAS GREAT! WAS TREATED KINDLY BY STAFF AND REIMBURSED FOR THE PROBLEMS. WOULD RECOMMEND CABINS USA, JUST MAKE SURE ROCKY RETREAT IS SPRAYED PROFESSIONALLY. Was pleased with our stay, besides the fact that the hot tub frame was broke. But the staff and cabin is very lovely and peaceful. Thank you for your review. We appreciate your stay with us at Rocky Retreat. We apologize if you were inconvenienced regarding the wooden frame around the hot tub. We have scheduled for a vendor to come out and address the damages. We appreciate your feedback, and we are glad that you had a great experience with us. We hope to hear from you again soon. The cabin was easy to get to. Upon arrival it was very clean. Furniture (chairs, beds, dressers, couches) all seemed very worn. Beds were not comfortable at all. Parking at this cabin is not the best because of part of the road being gravel. Overall it was a good experience and we would consider booking through Cabins USA in the future. Thank you for taking the time to write your review. We are glad you did enjoy your stay with us. We will have our inspector immediately inspect the comfort of the cabin. We look forward to hearing from you again soon. Do not forget about our return guest discount. The cabin was very clean when we arrived. There was a couple of issues that the staff handled very quickly and was most appreciated. The sofa was very uncomfortable and tv needs to be updated. Overall we we were satisfied and will use Cabins USA again. Thank you for your review. We apologize if you were inconvenienced at all during your stay with any issues. We are glad that we were able to quickly handle the issues you did experience. We will look into the sofa sleeper. We look forward to hearing from you again soon. All in all we had a good stay, we did have a few problems with wasps in the upstairs bedroom and the upstairs shower leaked through the ceiling in the kitchen, not sure if they fixed it we did notify the office. They need to make sure there cleaning crews clean under the furniture it was all very dusty and lots of dead ladybugs around the windows on the floor, which I am sure was due to the unseasonable warm weather. Staff was kind and friendly, very good, property is getting some age on it and could stand some updates. Next trip will try another property. We enjoyed our stay and loved the comfort of the cabin, very cozy. Thanks cabins USA we will definitely be seeing you guys again. WOW so much better than last time. We love this cabin, it took our breath away ! This was the third year in a row that I have stayed in a cabin in Rainbow Ridge and this was the first time that I was not satisfied. I had kids with me and they were very disappointed that the pool was closed. The main reason that I chose this cabin was because it was close to the pool. Not only could we not swim but we had to look at a dirty pool every time we were on the deck. If I had known that the pool was closed I would not have stayed at Rainbow Ridge, I love you guys buts kids complaining about not being able to go swimming was not good. I hope that you have either gotten the pool fixed or put on your web site that the pool is closed. I hope to stay with you guys again next year in June. My group always come in June. The sleeper sofa in the loft is very uncomfortable and needs to be replaced. Thank you. We had a great time, to bad the pool over the back porch wasn't working but we did have free access to the nearby pool, cabin was beautiful and location was good, We have stayed with Cabins USA several times and have enjoyed each stay. We had a great stay. Love the location. Excellent cabin. Only complaint was the lask of wifi. First off we LOVED the view was wonderful and quite too. However not having a propane grill was not what we expected when looking at the cabin it said grill most places we stayed had a propane one so disappointed we did not have one . We were also disappointed in there amount of dishes and pots and pans we had we have stayed other places and they had way more then what this cabin had so when we did cook we had to find ways to make the things we were because not enough pots and pans . The bees were a huge problem for us also we have a little girl who is allergic to them which could be deadly and we could not even sit outside until dark because the amount of bees on the porches . At another place we were at they came out and sprayed the bees for her safety. All in all it was a nice place to stay other than a couple of things and the fact pool was supposed to be opened by Easter was not and it was hot two days that we were down there :( The view was amazing and that is one thing we loved about this place . We have stayed with Cabins USA for past 4-5 yrs and have been very pleased. 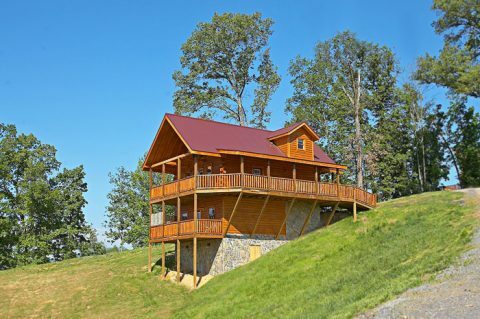 This cabin is not up to the standard that we are used to with Cabins USA. The basement walls are nasty and are in desperate need of paint! The cabin seems dark especially in bathrooms..more lighting needed. There is no trash bin only one "big" trash can outside which would not hold all garbage for 5 people staying 4 nights. The view would be nice if pool wasn't green and gross. We had to go buy pans to cook food on because there were none in cabin. Had to take remotes from living room to control the tv in downstairs bedroom and couldn't get upstairs tv to work. Also, parking for this cabin is very inconvenient. Although I wasn't impressed with this cabin, it will not stop me from booking with Cabins USA, in fact we have already booked our cabin for next year! Enjoyed our stay and our cabin. We did have a maintanace problem with upstairs tub that required us to call two days in a row to get solved. But, it did get fixed. I would like to mention there is a damp, mold smell in the game room area which may need checking on. Overall, our visit was great and we will return in the future! We were very pleased with CabinsUSA. Molly was very helpful. We enjoyed our cabin. Thank you for choosing Cabins USA. We are so pleased to see that you enjoyed your stay. We hope to see you again soon. There were a lot of dead flies/bugs in the floor and on the window jams. The wasps in the upstairs room would have been an issue if someone would have been sleeping in that room. Something need to be done to address this issue, might save someone's life (allergy). Rocky Retreat is nice for two couples. The only suggestions I have would be to have at least enough rocking chairs on the porch for 4 people (instead of 2 $3.00 plastic dollar store chairs. And the driveway needs a little work. It rained the first night we were there and getting up the driveway was a little trickly.